How does Dragon1 help out projects that are running out of time and budget? Today a follower on Twitter asked me: Mark, how does Dragon1 help me with projects running out of time or out of budget? Or is Dragon1 just a software tool and architecture method for creating basic architecture visualizations? Well, as you can read on other pages on this website you will see that Dragon1 is much more than a light-weight tool or method for architecture. But it is a good question to zoom in on what Dragon1 offers for projects and project managers. In dragon1.com, the EA/BPM tool, you can enter all the information and documents needed to start up, execute and finish projects running with or without architecture. So a business case and a project plan can be created and documented fully in the architecture repository of dragon1.com. With that a GANTT Chart, a work breakdown structure and product breakdown structure, can be generated of the project solution in the tool. 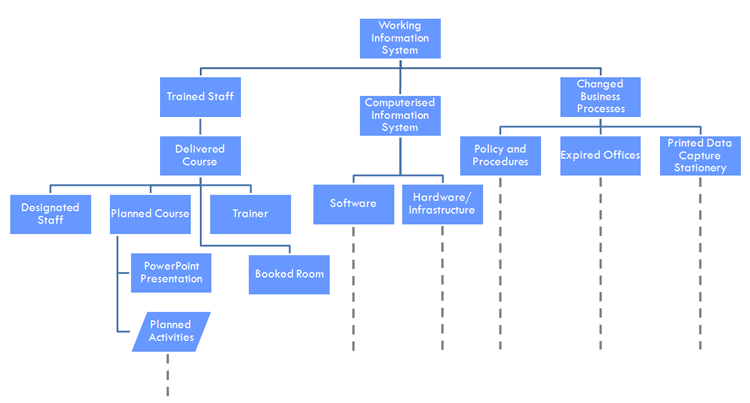 Also, a project landscape map of the project organization can be generated. A new feature in dragon1.com is that users, for instance, experienced team members, can create tasks for themselves or other users. And let's say, less experienced team members, can follow a checklist or step-by-step guide on how to create a business case or project plan, this next to using a predefined and editable content template for a business case or project plan in dragon1.com. In this way dragon1.com increases greatly the performance of the architecture team. Dragon1 is an Open EA Method and EA Framework. According to Dragon1, architects are considered to be designers of total concepts and also have the responsibility to supervise the realization of the solution in the architecture design. A lot of theory and best practices in Dragon1 are therefore about Project Management. In Dragon1 we have defined a architecture product called the Project Landscape Map. This project landscape map presents the architecture of the (temporary) project organization itself and can be used to fix issues in the project organization and in it's ecosystem. Often in project reviews 'a lesson learned' is that problems in the project organization should have been signaled earlier. With a project landscape map problems can be signaled and solved in a very early stage. One of the reasons is that with a visualization one can communicate problems much easier and much more clearly than without a picture or with text only. And of course a project landscape map is a default visualization type in dragon1.com to make the generation of it very easy. Dragon1 as Open EA Method has a Project Management section which contains checklist, for instance, the SMART IT Project checklist holding basic to-do's for a steering group committee to keep projects on the road. In every project more documents than mentioned here can be created, but the ones mentioned here are like beacons for everyone. Too many IT-Projects fail to deliver the expected results. And so for many IT Projects, it would be a solution for better project governance if the steering committee would perform the following Dragon1 SMART IT-Project checklist on a monthly basis. Is the module, system, solution or structure that this project will design or realize clear to everyone in and around the project? And what is the name and definition of it and where is a document with a brief description and visualization of the module, system, solution or structure? Is a business owner of this project known? And what is his name and function? Is an assignment to create a business case or start-up a project available? And what it its name and archive location? Is a valid and approved business case available? And what is its name and archive location? Is a valid and approved program of requirements (POR) and terms of reference (TOR) available? And what is its name and archive location? Is a valid and approved architecture or design document available (not created by the implementation partner)? And is there an A0 sized visualization of a landscape, roadmap or blueprint in the design? Is a valid and approved project charter, project document (PRODOC) or plan of approach for the realization (apart from the design) of the solution or structure available? And what is its name and archive location? Are changes in plans and document content, versions and history well managed for the business case, architecture/design, program of requirements and plan of approach? Are the business case, architecture/design, program of requirements and plan of approach visually aligned in an architecture poster or project landscape map? Is the age of the project, being a temporary organization, younger than 9 months? Is the main deliverable of the project of added value to the organization (check this with the business case and a strategy document)? If the steering committee would use this checklist every month in the end, every project will deliver something of added value to the organization. And especially that which is in the business case. My analysis is that 90% of all IT-projects fail at having a valid and approved design document available to project members and stakeholders. At the moment a lot of talks is about agile approaches and that it is hardly possible to create a big and blue design upfront of a project because everything changes so quickly. In my opinion, when architects have enough experience and knowledge about the subject at hand, it is always possible to create an architectural design of a solution upfront a project at least one level of abstraction (i.e. conceptual, logical, physical or implementational). My advice to them is also: pause the project for a week and create a BIG PICTURE of the project that is running out of time or budget, about where the project is coming from, where the project is now and where the project is heading to: a product breakdown structure and a work break down structure. 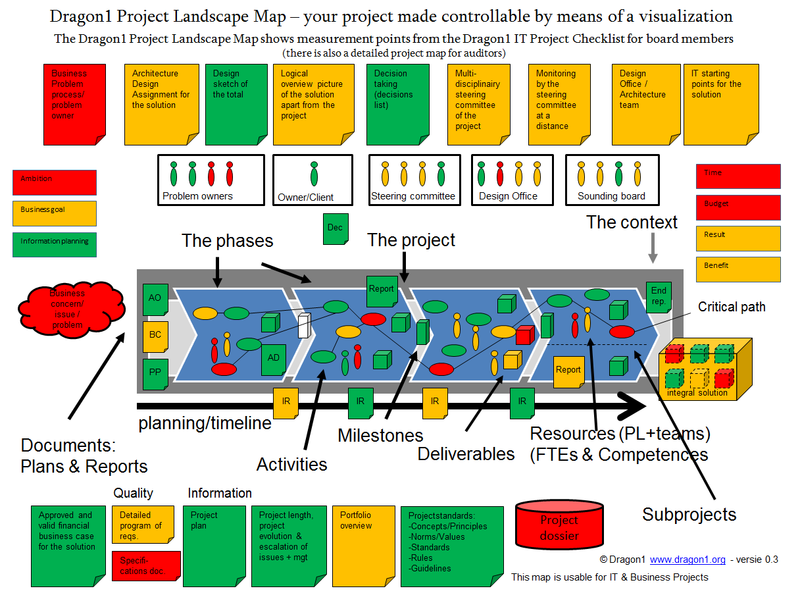 Read a blog about creating a project landscape map. Read about the IT project checklist and other checklists.